In Belize nearly all journeys begin and end in Belize City, the country's biggest urban enclave and port of entry, although in truth not a very enticing tourist destination in itself. Belize City sits in a swamp that stretches across Haulover Creek at the mouth of the Belize River, criss-crossed with narrow streets and rather smelly canals which are lined with a jolly jumble of buildings, some little more than dilapidated shacks and others attempts at rather pretentious modern stores. In between are some pretty wooden houses and colonial landmark buildings. The city has clung tenaciously onto its muddy roots since it was abandoned as a Mayan fishing camp in the 1600s and taken over by pirates and buccaneers as a logging camp. Late in the 17th century, along came the Spanish, who cut down the mahogany upriver, floated the logs downstream and exported them from the motley little encampment at the river mouth. 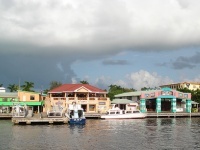 Later the British established Belize Town, which began the city's formal, rather tragic, passage into modern times. Three times devastated by fires, scourged by disease epidemics, flattened by hurricanes and tidal waves, the city somehow survived and today, in the new millennium, it subsists on tourism and fishing, remaining the cultural, commercial, and social centre of Belize despite the capital having been moved to Belmopan in 1969. Most visitors to Belize City come ashore on tenders from dozens of luxury cruise liners which include the city in their itineraries, mainly to allow passengers to take adventure excursions to see and experience the wonderful natural attractions of the interior and coastline of Belize. Cruise passengers are welcomed at the showpiece Belize Tourism Village, where courtyards and attractive buildings contain a variety of restaurants, souvenir shops, craft stalls, and other facilities to cater for their needs. It is the departure point for numerous land and marine tours. Independent visitors to Belize also generally start their exploration of the country in Belize City, and can find some sights of interest to fill a few days layover in the town, including the world's only manually operated swing bridge, some colonial architectural treasures like the Paslow Building, the novel St John's Cathedral built by slaves from bricks brought as ballast in ships from Europe, and the art gallery at the Bliss Institute, bequeathed to the city by British Baron, Henry Bliss, who died on his yacht in the harbour. Also well worth a visit are the Maritime Museum and Museum of Belize.